Perhaps more than any other demographic, today’s Young Professionals value community involvement and community empowerment. Together, they lend unbridled energy and commitment to the cause of bettering the region in which they live, work, and play. Their region is our region: Northern Kentucky. Brighton Center knows its own future rests in the developing the vision and empowering the results of those young leaders, and others like them who will follow in the years ahead. For that reason, Brighton Center welcomes the collective involvement of the region's young professionals through Brighton Center’s Junior Board. Designed to support the mission of Brighton Center through leadership, advocacy, volunteerism, and fundraising, the Junior Board offers Young Professionals (and rising leaders of all ages) a unique introduction to the diverse work of Brighton Center and a chance at developing as tomorrow’s community leaders. 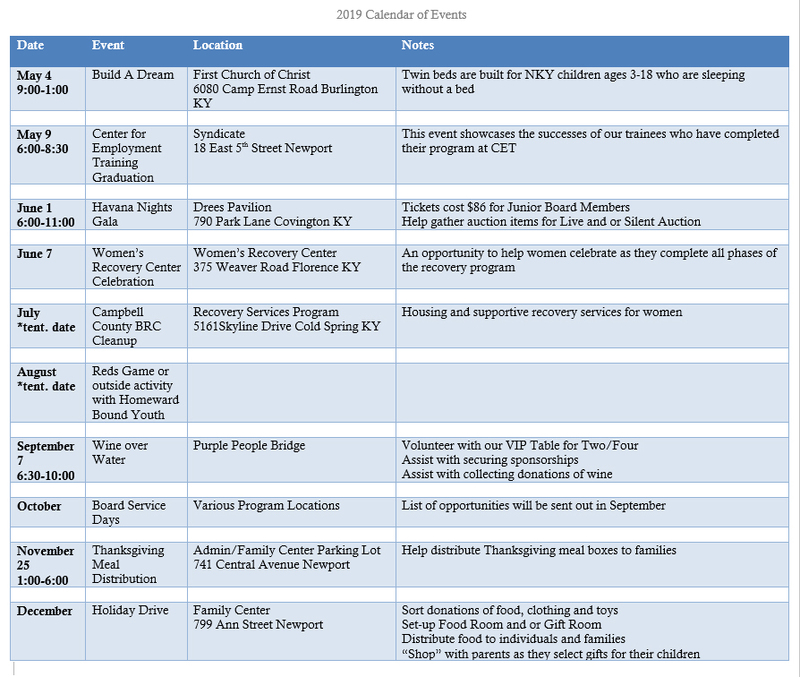 This group will serve as a catalyst for Brighton Center to support its mission of assisting Northern Kentucky families on their journey to self-sufficiency. Support will include, among other things, leadership, advocacy, volunteering and fundraising activities. To develop a group of young leaders who will serve as advocates for Brighton Center. To give young professionals looking for engagement the opportunity to become civically involved in their community. To help young professionals create a network of other like-minded or like-guided persons. To help young professionals find a professional mentor from the current Brighton Center Board. To expand the services of Brighton Center to include a program of professional development for future community leaders. To help the Development Committee raise more funds for the Center. 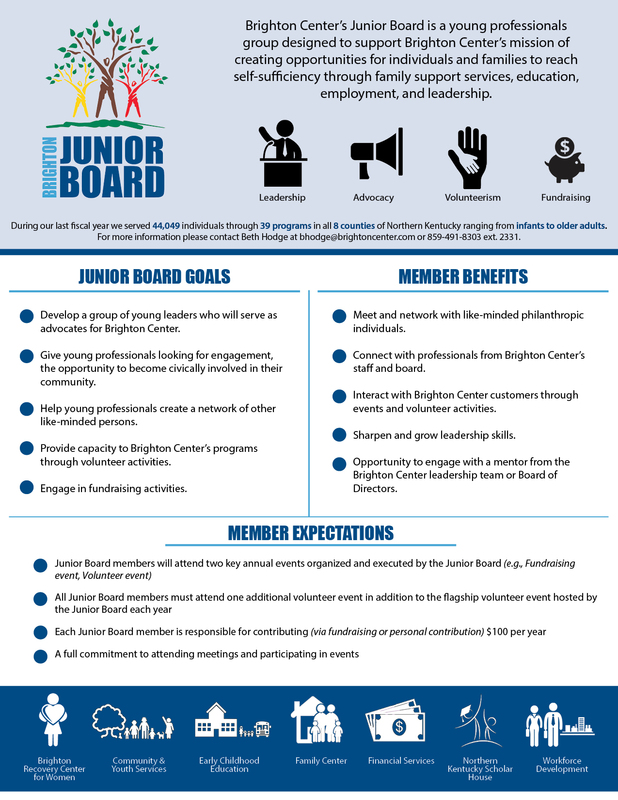 While open to all ages, the Junior Board's target demographic is young professionals between the ages of 25-40, interested in serving the needs of Brighton Center. For more information, or to submit an application for consideration on the Junior Board, contact Beth Hodge at bhodge@brightoncenter.com or (859) 491-8303 ext. 2331.